Salman Khan and Jacqueline Fernandez are filming Race 3 in Kashmir but going by Jacqueline's latest post on Instagram it appears they are two different climatic zones. 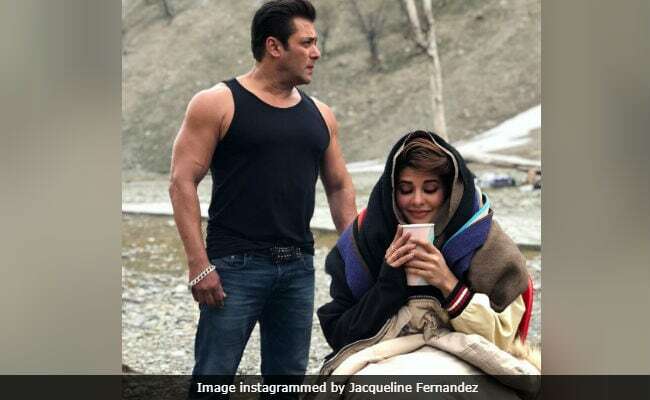 In a photo instagrammed by the 32-year-old actress, Salman Khan, 52, dressed in denims and a gunjee, can be seen admiring the picturesque location while Jacqueline, sitting next to Salman, is wrapped in several shawls and is sipping a hot drink. Jacqueline's Rudolof-ish look proves it's very, very cold out there. But Salman Khan is "too hot to handle," as Jacqueline put in the caption. As of now, the team of Race 3 is travelling from Kashmir to Ladakh by road - probably to get acclimatised. Fan clubs have shared several photos and videos of the ongoing shooting and one post features Salman and Jacqueline enjoying a bike ride en route Leh-Ladakh. Here are snippets from their road trip. Race 3, directed by Remo D'Souza, brings Salman and Jacqueline together after their 2014 hit Kick. The film also stars Bobby Deol, Daisy Shah, Anil Kapoor, Saqib Saleem but none of them were a part of the Kashmir-Leh-Ladakh schedule. Is Remo filming a romantic track featuring Salman and Jacqueline there? Earlier the team shot action sequences in Abu Dhabi and before that in Thailand. Race 3 changed the filming locations from abroad to India after the Blackbuck verdict. Though Salman now has the court's permission to travel abroad (he's announced the USA dates for the Dabangg tour) the team apparently decided to go ahead with the Indian locations. Race 3 is slated for an Eid release this year.